Posted by thegulfblog.com in Russia. One of the missiles on offer is a special anti-ship variant with a second stage which splits off after launch and accelerates to supersonic speeds of up to Mach 3. Apparently, Emirati authorities have shown an interesting in buying the Club K system, but then again, what piece of new technology have the not shown an interesting in buying recently? Given the high and unprecedented ease with which this system can be moved around it is causing some consternation in Washington DC where it is feared that it might get into the wrong hands i.e. Iran. Any source on Emarati interest in this system? I fail to see any use of it for the UAE armed forces. 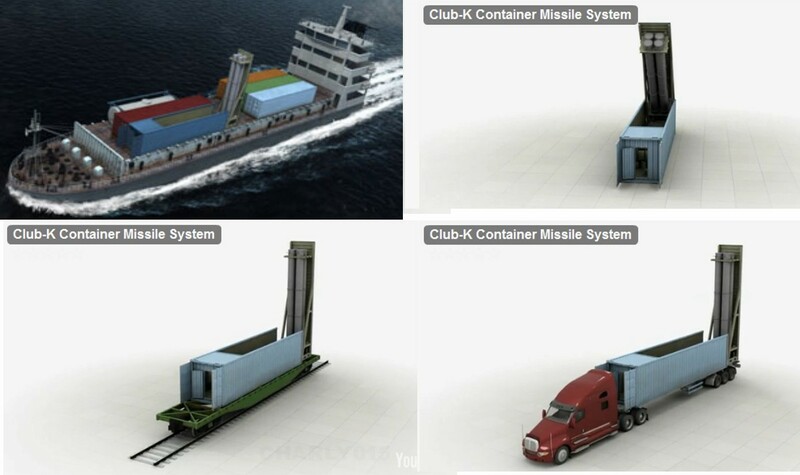 If the UAE want’s CLUB’s the can get them, but why on a trailer/container ship/train. the UAE has no railways (aside from the Dubai & Palm Metro/Monorail) and trailers are hardly ideal for the UAE’s terrain, 8X8 vehicles would be more suited. Container ships operated by Indian and Philippine sailors hardly make good platforms for cruise missiles, especially ones meant to be launched “discreetly”. The MTCR (which both Russia & the UAE have ratified) states that missile cannot be exported with more than 500 KG warhead weight and 300 KM range. The only place these are any good to use would be in Ras Al Khaimah towards Iran. With Mach 2.9 terminal speed they can hit almost anything (even with CIWS for defense) once they are provided with the correct satellite feeds. C) Buying Brahmos/CLUB missiles for their corvettes/frigates. All I know about the Emirati ‘interest’ is what’s said in the article. That’s a most useful and interesting post. Thanks. You make a convincing case that this system would not make sense for the Emirates. If ever there really was some Emirati interest expressed, this then highlights, I would suggest, the perennial problem of the individual v bureaucracy that I mention quite frequently. ‘A’ General/Brigadier thinks ‘ooh, that looks great. I’ll have 10’ whereas a measured analysis by the military bureaucracy would, as you suggest, come to different conclusions. Having said that, I doubt very much that the Emirates will end up buying the Club K.